There is still a lot that is not known about the endangered cassowary. Their shy nature and dense rainforest habitat makes research difficult. 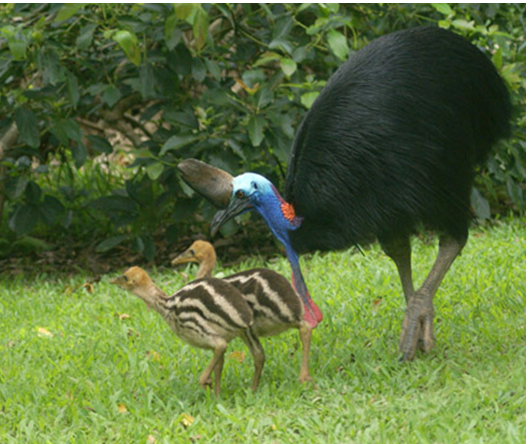 We were able to gain fascinating insight into the lives of a cassowary family at Garners Beach by piecing together information shared by the community over a period of time. A photo was taken on the 6th August 2010, the first chicks to be reported at Mission Beach for the season. ‘Dad’ and ‘Bella’ stayed together for about 6 weeks before being seen separately. It is not uncommon for the male and female to reunite after the chicks have hatched but what was observed with this family is when they were seen separately one chick stayed with the male and two with the female for about a week before being seen again as a family unit. The occasional uniting and separating continued with the female and male seen at different times with a different number of chicks. The last time they were all seen together was in October after which there were regular sightings of the male with the two chicks crossing the Garners Beach Road. 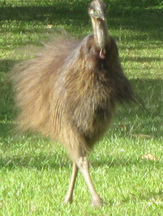 The female was then seen regularly rearing one chick. The unusual story ended in tragedy when the male with his two chicks perished after being caught in a pig trap in December 2010. 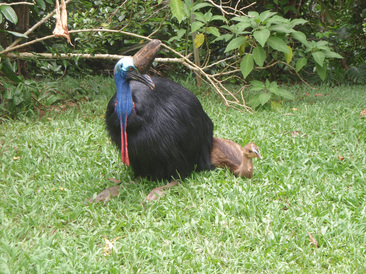 The large old female 'Bella' went on to successfully raise her chick, both surviving Cyclone Yasi. 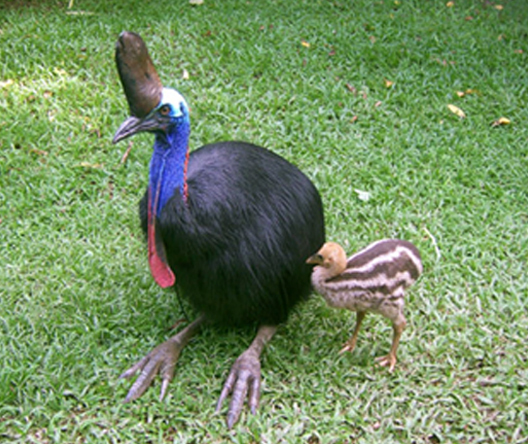 Bella and her chick were observed together over the next few months until they separated. The juvenile bird was seen several times as it dispersed looking for a territory of it's own. It could easily be identified by the uneven wattles which were noticeable from a young chick.